Book an Epreville-en-Lieuvin vacation package on Expedia right now! This is by far one of the simplest ways of saving money and time for your awesome adventure. Book now on Expedia and save up to 42%*! It's that easy! With more than 400 partner airlines and 321,000 worldwide properties for you to choose from on our international database, you'll be jetting off on your next vacation in no time! Still undecided? There is no extra fee from us if you change almost any reservation. We have all the sightseeing info you need for your impending trip to Epreville-en-Lieuvin. Grab your travel organizer and get ready to start filling up that itinerary. If you've ever hankered for the 'Eat, Pray, Love' experience, why not live out the 'pray' part at Bec-Hellouin Abbey? Work on your spiritual development and perhaps even find yourself! There's a wonderful range of things to do nearby. If the young ones are tired of sightseeing and need to expend some energy, why not take them on an outing to L'Abbaye Park? It's the perfect spot to play tag and chuck a ball around. Still have some time to spare? Are you simply wild about animals? Grunt, squeak and squawk with some of the most unique of them at Parc Zoologique Cerza. It promises to be a fun day out for kids and adults alike! Expedia presently features no property listings for Epreville-en-Lieuvin. However, you'll discover a few places to stay in Lieurey, which is 3 miles (5 km) away. The Le Petit Coq Aux Champs and La Ferme Saint Nicolas are among the best options in Lieurey. Nothing's more satisfying than finally disembarking at Saint-Gatien Airport (DOL) after being confined in a cramped cabin for hours. After you've picked up your baggage and stretched your legs, you'll find yourself just 20 miles (32 km) from the center of Epreville-en-Lieuvin. 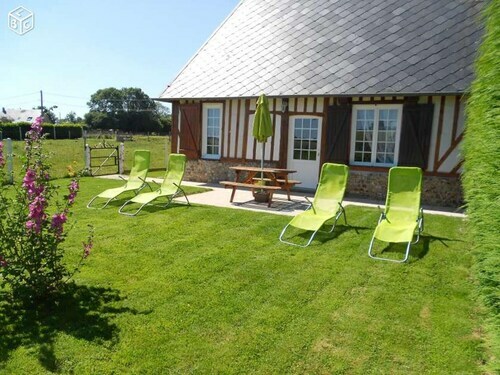 Situated in Epreville-en-Lieuvin, this cottage is 11.2 mi (18 km) from Bec-Hellouin Abbey and within 20 mi (32 km) of Sainte-Therese Basilica and Lisieux Cathedral. Beaumesnil Castle and Chateau du Champ de Bataille are also within 25 mi (40 km). Situated in Epreville-en-Lieuvin, this vacation home is 10.5 mi (16.9 km) from Bec-Hellouin Abbey and within 20 mi (32 km) of Beaumesnil Castle and Chateau du Champ de Bataille. Sainte-Therese Basilica and Lisieux Cathedral are also within 20 mi (32 km). 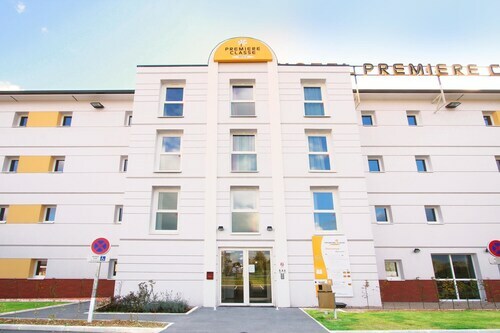 Situated in the business district, this hotel is 1.6 mi (2.6 km) from Sainte-Therese Basilica and 1.9 mi (3.1 km) from Lisieux Cathedral. Calvados Pierre Huet is 12.1 mi (19.4 km) away. 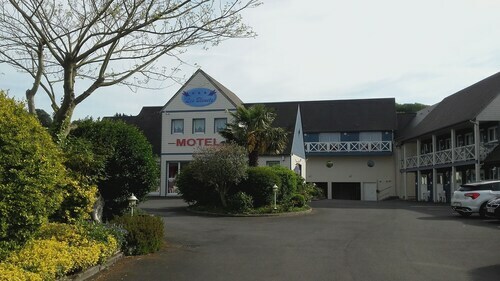 Situated in La Riviere-Saint-Sauveur, this spa hotel is within 1 mi (2 km) of Honfleur Normandy Outlet, Tourist Office of Honfleur, and Salt Halls. Old Harbor of Honfleur and The Lieutenancy are also within 1 mi (2 km). Situated in Honfleur, this hotel is within 1 mi (2 km) of Tourist Office of Honfleur, Salt Halls, and Old Harbor of Honfleur. The Lieutenancy and Quai Sainte Catherine are also within 1 mi (2 km). Situated in La Riviere-Saint-Sauveur, this hotel is within 2 mi (3 km) of Honfleur Normandy Outlet, Old Harbor of Honfleur, and Sainte Catherine Church. Eugene Boudin Museum and Satie Museum are also within 2 mi (3 km). Situated in Pont-l'Eveque (Calvados), this spa hotel is within 9 mi (15 km) of Amiraute Golf, Deauville Beach, and Château du Breuil. Saint-Laurent Chapel and Deauville La Touques Racecourse are also within 9 mi (15 km). Pont-l'Évêque Station is 7 minutes by foot. Situated near the airport, this hotel is within 1 mi (2 km) of Honfleur Normandy Outlet, Tourist Office of Honfleur, and Salt Halls. Old Harbor of Honfleur and The Lieutenancy are also within 2 mi (3 km).